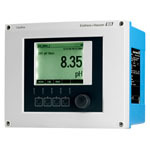 Liquiline CM44 is a digital multiparameter controller for process monitoring and control in industrial and environmental applications. Liquiline CM44 is a digital multiparameter controller for process monitoring and control in industrial and environmental applications. The modular four-wire controller is available as one-/two-channel, four-channel and eight-channel version and can be extended at any time. It is based on the Memosens technology. Endress+Hauser works to a defined standard production time (from order entry to goods issue) depending on the variant of the Liquiline CM448. Production times can be confirmed via your contact person or via the online shop. Endress+Hauser will ship your order direct to your delivery address. In certain cases express or emergency shipments can be made on request. Check your order status online using your reference number or the Endress+Hauser order confirmation number. Spare parts are handled as standard products with a short standard delivery time. On request we deliver on shortest possible delivery time (extra charge).